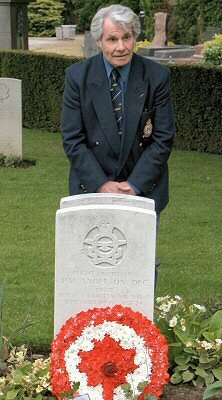 John Pearl, Rear Gunner (right, at his pilot's grave): "I am here today to lay this wreath at the headstone of my skipper Peter Murray Anderson, popularly known as Andy. I lay it on behalf of myself and my fellow crew members: Ken Larcombe, Bomb Aimer, now living in Canada having emigrated there in 1956 and Cyril Hewett, Navigator, resident in Sidcup, Kent. Our Wireless Operator was Vic Collins who sadly passed away at an early age; Ted Nichols, Flight Engineer and Eric Matthews, Rear Gunner have also died. Andy came from Union Point near Winnipeg, Manitoba and it was at Winnipeg he enlisted in the RCAF in September 1941 for pilot training. He flew on ops with 97 Squadron and whilst with them he was commissioned and awarded the DFC and later merited a Mention in Despatches. On completion of his tour, which had included a number of targets in Italy, he was not happy with the duties allotted to him and he became a nuisance with his constant pleas to be allowed back on ops. Eventually, higher authority relented and acceded to his requests. However there was a catch - his way back to ops was by taking on a crew still in training at Heavy Conversion Unit and completing the course with them. Instead of the crew of first tour veterans he had hoped for he was saddled with us, a bunch of greenhorns. We were in limbo at Swinderby, a crew without a pilot. The New Zealander we had crewed up with at OTU had been taken off the course. It was not that he wasn't an able and competent pilot - on the contrary at OTU he had earned a Commendation for a remarkable display of airmanship when we found ourselves in a hairy situation one night. No, his problem was that he was a small fellow and had neither the physique or strength to handle the four-engined Stirling, especially during evasive manoeuvres which had to be perfonned violently and required strong handling of the controls to be effective. Andy took us on and saw us through the last stages of our training and on to 207 Squadron. Our last op together was the Wahren railway yards at Leipzig when we flew as supporters, backing up the marking crews. Over the target we were hit by flak, which put paid to the two starboard motors which were feathered. At that point the Controller called in the Main Force and so we did an orbit and flew over the target for a second time to do our bombing. On leaving the target area we were hit again, on the port side but we were still flying, so set course for base. We had been flying for about ninety minutes when the oil pressure on the port inner engine began to fall and we started to lose height. On Andy's instruction we prepared to abandon the aircraft and took up our places at our exit points. Andy ordered "jump, jump, jump" and we all successfully baled out. Regrettably Andy didn't make it and perished when the plane crashed. Like many pilots before him he had stayed at the controls too long in order to ensure every crewman had got away. His courage and self sacrifice saved our lives and will be eternally remembered. I will now place this wreath upon the grave." to greet you - you will understand." Brussels Town Cemetery grave location: X. 21. 5.
t/o 1807 Spilsby Wahren railway yards, Leipzig. Arrived over the target area and while running up towards the AP was hit by predicted flak. Both starboard engines were damaged, as was the mid-upper gun turret. Despite this severe damage, the crew made a second approach and bombs were released at 2300 from 14,000 feet. Further damage was inflicted, this time on the port side, but for the next hour F/L Anderson RCAF managed to maintain control until his flight engineer reported oil pressure on the port inner was dropping fast. At 4,000 feet, as ordered, the six survivors baled out and all were soon in safe hands. 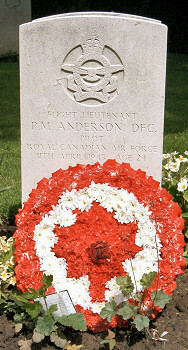 F/L Anderson RCAF is buried in Brussels Town Cemetery. 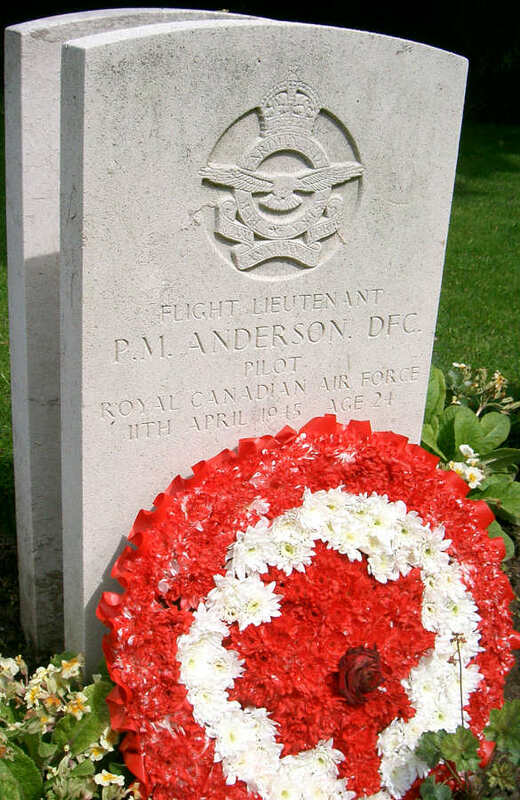 ANDERSON, P/O Peter Murray (J16379) - Distinguished Flying Cross - No.97 Squadron - Award effective 11 March 1943 as per London Gazette dated 26 March 1943 and AFRO 757/43 dated 30 April 1943. Born in Manitoba, 1922; educated at University of Manitoba; home in Union Point, Manitoba; enlisted in Winnipeg, 1941. Trained at No.4 ITS (graduated 16 August 1941), No.18 EFTS (graduated 10 October 1941) and No.15 SFTS (graduated 2 January 1942). Commissioned 1942. Award presented 13 July 1948. Photo PL-17320 and PL-19320 taken after investiture with F/L Charles R. Blemengauer; PL-25551R is a portrait. This officer has completed numerous sorties including several attacks on targets in Italy. He has always displayed great courage and skill. One night in February 1943 he completed a successful attack on Lorient in difficult circumstances. Three nights later he flew with distinction in an attack on the same target. ANDERSON, F/O Peter Murray, DFC (J16379) - Mention in Despatches - Overseas - Award effective 8 June 1944 as per London Gazette of that date and AFRO 1729/44 dated 11 August 1944. No citation in AFRO. Son of James and Jessie Thompson, of Glencraig, Fife. Citation: The London Gazette of 16th February 1945 gives the following details: "Flight Sergeant Thompson was the wireless operator in an aircraft which attacked the Dortmund-Ems Canal by daylight on 1st January, 1945. Just after releasing its bombs, the aircraft was hit by a heavy shell which set it on fire and caused extensive damage. Flight Sergeant Thompson without hesitation went through the fire and exploding ammunition and rescued the gunners from the mid-upper and rear gun-turrets, both of whom were unconscious. With his bare hands he extinguished their burning clothing. He then with great difficulty made his way back through the burning fuselage to report to the captain of the aircraft. He might have devoted his efforts to quelling the fire, but preferred to go through it to save his comrades, hazarding his life. Three weeks later he died of his injuries. 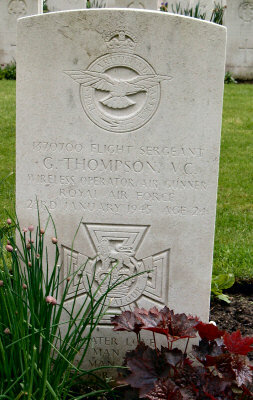 One of the gunners he rescued survived; he owes his life to the gallantry of Flight Sergeant Thompson, whose courage and self-sacrifice will ever be an inspiration to the Service."